1. Cut one piece of 8 1/2" x 11" paper into 1" strips (oriented landscape so you end up with 11 strips). 3. Put a little piece of double-stick tape at the tip of the first "page." Then bend it inward toward the center and stick it down. Repeat for every "page" until you have a circular flower shape. Of course I had to do an orange one. This is perfect, just what I have been looking for. THANK YOU! Oh this is cool! I work at a printing company, and our Christmas tree is from all recycled paper, so this is perfect! Thank you! You're very clever! so cute!! they look way more complex than they are! they look gorgeous...excellent project to do with your kids too. Awesome! I need to make some of these for our tree. Most of the ornaments are handmade, but I decided that it is looking a little bare. Thanks! Very clever. They look great! I'm going to make these to decorate around my wedding/reception in January!!!! Awesome! I needed some embellishments for my sister's birthday present...this worked perfectly! ooh, these are so pretty! i hope i have some time to make these as i'd love a whole string of them around our dining room! Thank you for your creativity! These are perfect. Could you be any more crafty or classy? Geez, all I ever do when I watch CSI is put my hands over my eyes and go "Ew! Oh, ew! Oh man, don't pick that up! EW!!" Amazingly simple and they look great! These ornaments are gorgeous ! I think I will put my quilts away and I will make some ! Thank you ! ooh I love these, might get the little boy and dad involved in this project - we're having a big xmas paper making extravanganza over the enxt week so it's perfect to throw into the pot! thank you. this is awesome!!! i love this idea, i'm going to make them for sure! Wonderful - this solves my dilemma about what to put on the top of our tree instead of a traditional fairy! Seriously and completely amazing. I especially love the fact that they're not overtly festive - perfect for a Christmas grouch like me! Thanks for sharing. Very cool idea, Jessica. You are so creative! I love your blog. Thanks so much for this project. I love these. 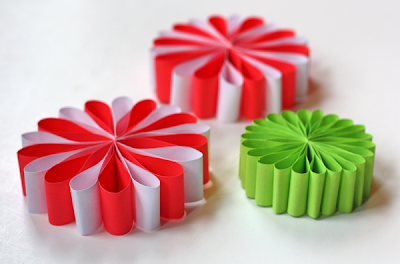 So pretty and easy to make from paper! Thanks! So creative! I like this idea and I love CSI :). Perfect for a wedding shower I will be throwing! Thank you! These are great! I love the simple projects that look like they took forever to make! Thank you for sharing! I love, love, love these! Thanks for sharing. I'll be making some this week. such a cute, cheap, and easy way to make ornaments. I think I will try ribbon instead of paper. We'll see how that turns out. these would be great as gift toppers too! 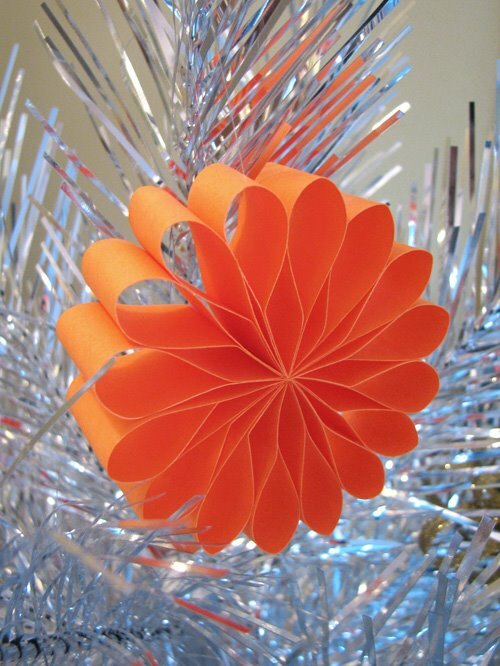 On the two-color ornaments, how did you avoid 2 petals of the same color in a row?? You're right; you get one extra red and one extra white. I cut off the duplicates very close to the staple. Wow, you answered so fast! I cut it off about 1 cm and then looped the other half over the stub to hide it. While we're at it - I'm usually a lurker, but I love your site! I have some old-timey, thin scrapbook paper. This will be a perfect use for it. So cute. These are gorgeous! Thanks for sharing this wonderful idea. I especially love the two-colored versions. Got to give them a try! They look very retro on that swanky silver tree! Thanks for this cute project. I sat at my desk and made one this afternoon instead of grading papers... ha. But, it went together oh so fast and I went back to my grading. Another use for the paper flowers...gift box decorations. I was in need of a box topper and the flower worked perfectly! Again, thanks for the idea. It's so cool and easy. Thanks for the idea! I made 7 of them and it was fun. I have just the paper to make those with! Thanks for the tutorial! Love these too! Love the silver & orange combo! Thanks! This is so great!! thanks for the tutorial! now i have the PERFECT decoration for my gift boxes, parties, table settings, you name it! you're so fabulous :) if i'm ever in the midwest again i have to look you up :) thanks again! I made some! Check out my blog for pictures. Really...not the best pictures but oh well. Oh and I love your silver tree. Oh my gosh! These are so pretty and delicate looking... and who would have guessed they were fairly easy to make? Thanks for the great tutorial!! very nice.... the color and designs also need some ornaments on paper, i ve tried to search the same in google too.. found a site called www.virtual-enchant.com, but there is no option to buy in australia... can any one suggest me like that to buy in usa. Best instructions on web. Its been 40 years since I've made these. Thanks for the refresher. These are so beautiful and easy. I was inspired by the bright colors. I made some to hang from the ceiling for my daughter's birthday. Thanks for the wonderful tutorial. I am writing to request permission to reprint this adorable project on Craftown.com. We would of course give you full credit and will happily link back to your blog. Please let me know if this is acceptable. Thanks! Hi Amanda! You're welcome to link to the project and use an image or two, but I'd ask that you don't lift and reprint the entire article. Thanks for checking! My children and students will LOVE this!!!! I'm linking to this amazingly cool and simple craft from 10 Awesome Christmas Paper Craft Ideas. Of course, you are one of the ten. Thanks for sharing this idea. Such a cute idea. Have many places to go wtih some downtime in between. What a clever little project to take to spend the time. Love it and your site. It's awesome. i tried 2 but they look uneven and dont join in the middle, any tips? What do you hang stuff like this with if you want to hang from a ceiling to not leave a mark? These are gorgeous. Can't wait to make some. Thank you for the inspiration. Ooo, I bet they would look good using leftover wrapping paper or Christmas cards. I made these last year but didn't know to staple them. That is a fabulous way to fix what went wrong with mine! Thanks! I used them as bows on my gifts. now to recover the stapler from my kiddlets room... or maybe just buy a new one...awesome! This is great, going to try one myself. 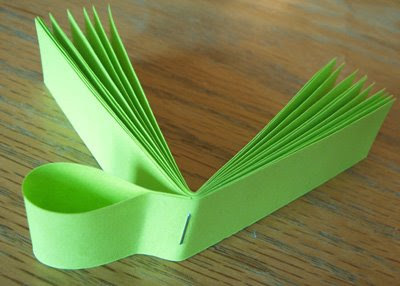 I am also going to try one with a paper punch design, punch each strip before assembling to see how that looks as well. This is fabulous! Thank you so much, I can't wait to get started! Especially while my husband is watching Top Gear...again! Thank you! I live in a Senior Apartment building, and like to decorate the bulletin boards there. This is one more great idea to help me along this year. Can you share your strategy for the red/white one? Wouldn't there be two reds and two whites next to eachother? Did you cut one half of each color off? If I remember correctly, I think I cut off half of something at the end to keep the colors alternating. You're right. you're welcome to see my version. THANKS so much!!! i have been looking everywhere for something like this!!!!!!!!!!!! How do you make them so even? I tried it too, but they stand quite uneven. How big the piece of double stick tape should be? would this work with ribbon?? they look sooo pretty! Thank-you for sharing! Barbara, it would if the ribbon was stiff enough to keep its shape. If it's not, you could maybe experiment with a fabric stiffener on it. One brand is Stiffen Stuff. Other companies make a product like that, too.